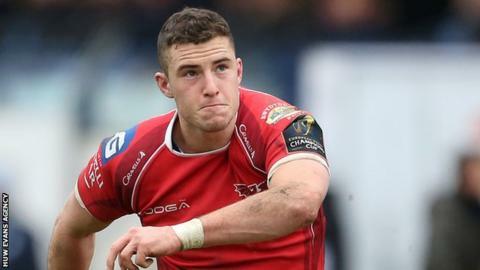 Fly-half Steven Shingler will join Cardiff Blues from Scarlets for the start of the 2016-17 season. The 24-year-old moves in the opposite direction to Wales international Rhys Patchell, who is leaving the Arms Park for Parc y Scarlets in the summer. Like Patchell, Shingler can also play at both centre and full-back. Blues head coach Danny Wilson said: "His goal-kicking and kicking in general play is very strong and he has a lot of experience." Shingler, brother of Scarlets' Wales flanker Aaron, is a former Wales Under-20 fly-half. He has scored 322 points in 63 appearances for Scarlets, but remains uncapped. Shingler had a two-season stint at London Irish in the English Premiership before returning to Scarlets for 2013-14. He was also at the centre of a dispute between Scotland and Wales over his international eligibility. That was settled in Wales' favour by what is now World Rugby after Shingler was named in Scotland's squad for the 2012 Six Nations. His fly-half rivals in Cardiff will include Wales utility backs Gareth Anscombe and Matthew Morgan, with the latter also among Blues' new recruits. Ulster number eight Nick Williams and Saracens' Wales prop Rhys Gill will also join the club from next season. Shingler said: "Danny Wilson is assembling a great squad, recruiting strongly and I hope I can play my part and help the region achieve its long-term aspirations."